The age of his explosive power may be gone but Alex’s routes are becoming increasingly important. 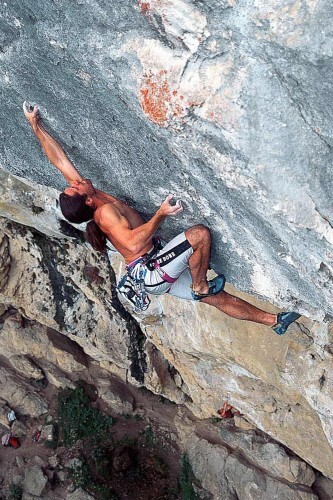 His big wall projects in mountains are mostly unrepeated…This is an interview with an all-round climbing master. When he describes his home in the south of Germany, he puts down his pint and gestures animatedly: “I’m taking care of about four hectares of soil. 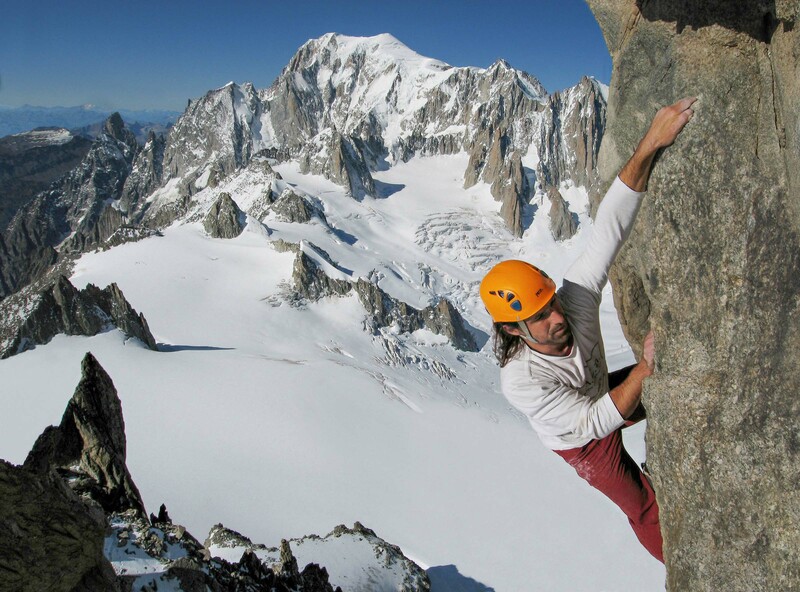 That’s a wholly new responsibility for me,” says the famous climber. Sitting with us over a beer, he boasts with pictures of a fresh lawn under peaks of the Alps, barefooted children (“my two princesses and a prince,” as he refers to them), red geraniums, a view of the Watzmann mountain, and a farm with thirty sheep. “We produce around 800 kg of meat per year,” he counts. Is he becoming a stay-at-home dad? Fortunately not. 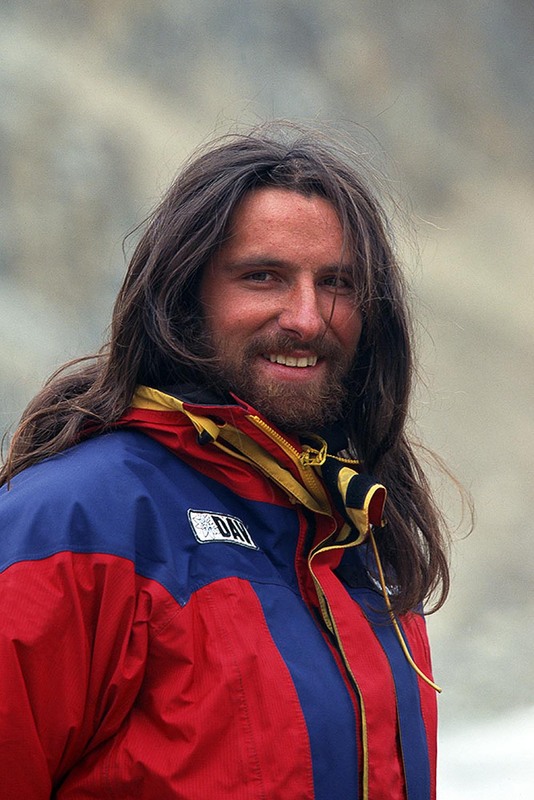 He plans another demanding expedition, and when he starts talking about climbing and mountains, you can see him getting twenty years younger… You can still feel the enthusiasm which drove him in the 90s when he was fighting to reach the peak of Latok II (7 108 m) in the Karakoram. When I was browsing through your photos and notes from the expedition to Latok II in 1997, I had a sense that there was a perfect “team spirit” present. How do you remember those days? It was quite a challenge. I first set out for the Latok II as early as 1995 but back then we had to admit that we had chosen the wrong time. We went there too late (the end of July, August) and the rockfall danger in this face was too high because a lot of the ice was already melted. However, we all knew that we would have to come back because the west face of Latok II was simply entrancing. 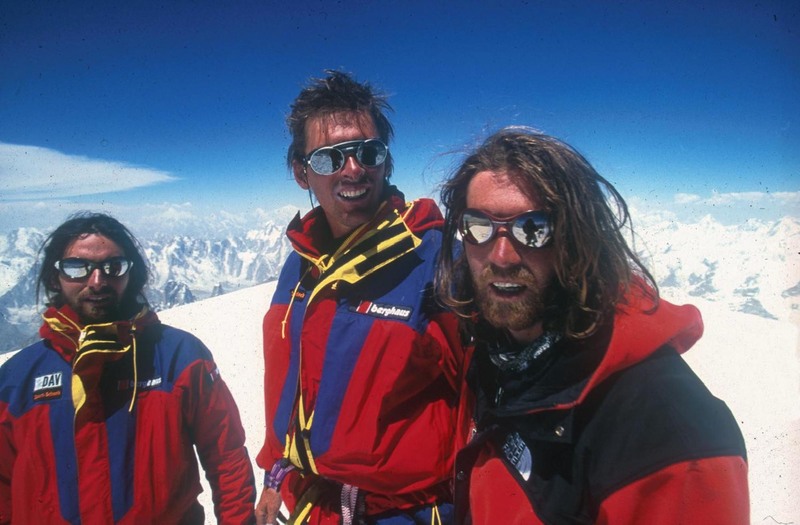 When I finally returned, the team included strong climbers such as Conrad Anker, Toni Putsch and most important: my brother. The only way to the summit could be achieved by a hard toil, which demanded dedication from the whole team. 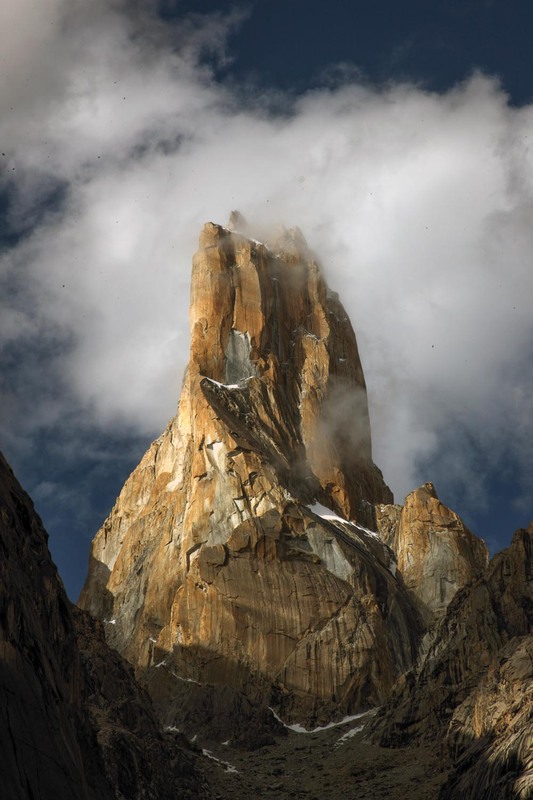 The difficulty can be likened to climbing the face of El Capitan at the height of Denali. 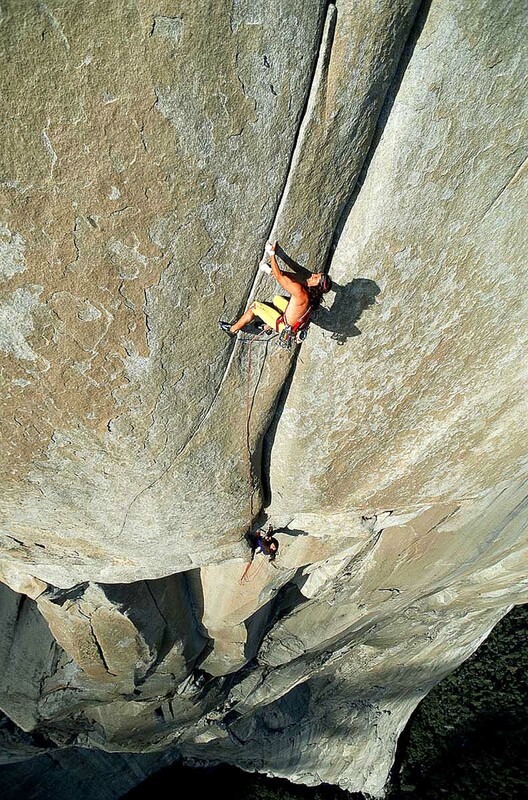 After the expedition, you said that the rock is even more compact than El Cap. I think that we’ve made a first ascent of the easiest route possible on this wall, and it came out more difficult than “Freerider” (7c+, 37 pitches on El Capitan). So there are not many crack systems. That’s right, the wall is really smooth. It is perfect quality granite. I’m not even sure if you can find something similar anywhere in the world. On top of that, if you consider the shape of the mountain, it’s just amazing – it looks like a diamond. What was the last day of climbing like? We left everything in our suspended camp at the height of 6500 meters, and started climbing light for the last 600 meters up to the summit. Afterward, we abseiled the same way down. What have you learned during this expedition? I’ve learned that if you face a really big project, you should sometimes expect giving it more tries. Since then, I know that complex projects often require you to return to them with more experience. Often, you have to earn that experience during the first attempt. Furthermore, everybody has to be fully committed to the project. Last but not least, climbing in high altitude can be very demanding – it is often on a borderline with a feeling of suffering. There it meant 10 days without proper rest, moving higher and higher. Was it a breakthrough for your climbing career? Hard to say, I think that I became famous among climbers thanks to my sport routes “Om” and “Weisse Rose” (he suggested 9a grade to both). But I have captured the full attention of an international climbing scene after I have freeclimbed the “Salathé Wall”. 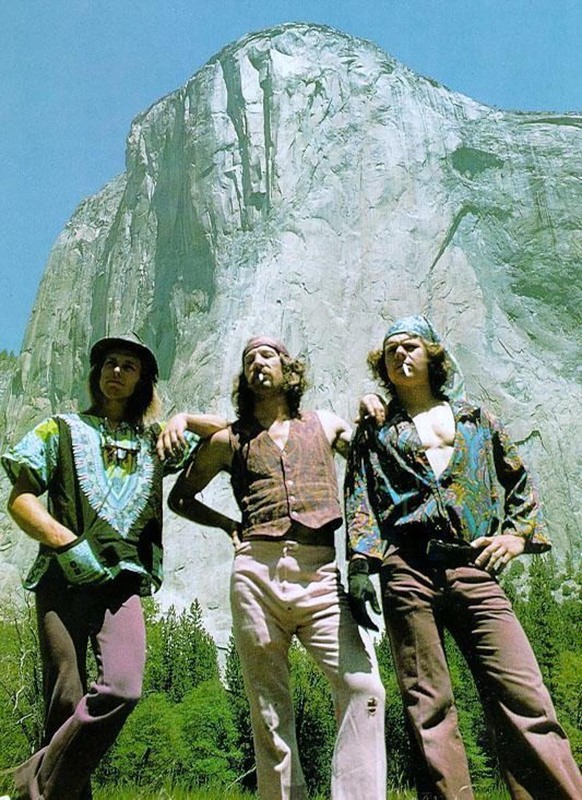 For me, it was easier than sending sport routes as “Weisse Rose” but I did that at a place, which is central for all the climbers of the world – the Yosemite Walley. So the breakthrough wasn’t my sport or mountain routes but the red point free-climb of “Salathé” (8a+, 37 pitches). How did you train back then? We followed the ideas and thoughts of Wolfgang Güllich. 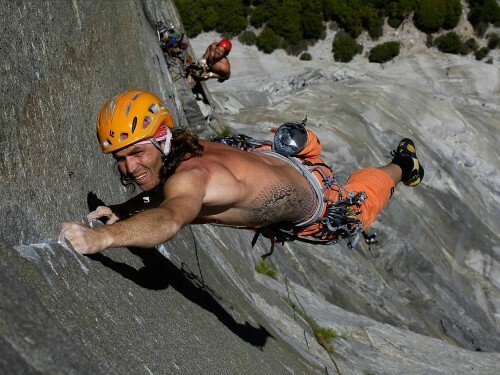 He was one of the guys who found out that you should incorporate training techniques from other sports into climbing. It was the time when climbing became a truly established sport. If you wanted to become stronger – you had to train a lot. By the way, until 14, I was very good and successful downhill skier. Then I gave it up because it was easy to see for me that I would never have made it to become a top ski racer but much more like one of those who you would find 15th or 20th in the ranking. And for this, all the racing circus was too stressful for me. However, I already knew what it is like to train professionally. With your brother Thomas, you developed “system board”. Can you describe what it is? It’s not an ordinary campus, but one that has footholds under it. We have developed systematic holds – edges, two-finger holds, monos… We climbed up and down as on campus but using footholds. That’s because I had a feeling that I’m strong from the campus, which is good, but real climbing is not hanging. Instead, it is mainly movement on an overhanging rock, directed by feet and fingers. That entails a different kind of muscle coordination. Today, I know that that I was right. If I would compete with other climbers from Frankenjura on campus, I would be no match for them at all. However, on the rock, I am the stronger climber (he raises his eyebrows as in a question). So I think that hanging alone doesn’t mean anything. You have to teach your body that specific coordination. Effects of campus end at chest muscles while the system board goes all the way down to your feet. How many times were your three hardest sport routes repeated? “Om” – one repetition. “Weisse Rose“ – one repetition. “Open Air“ – one repetition. All of them climbed by Adam Ondra. Mind that the reason is not that others avoid trying these routes. They are still working on them. We have for example some climbers who have topped ten routes of the grade 9a, and one 9a+ but are not able to climb “Weisse Rose”. Today, the grade of “Weisse Rose” is definitely 9a+, and “Open Air“ as well. “Om” still holds the grade 9a. Adam did a great job. I would move back to the Yosemite Valley for a while. Concerning that area, I always imagine you as in the famous photos of you and your brother on a meadow in front of El Capitan. Unfastened long hair, sharp look in your eyes. Should I see it as a kind of joke? That pose is inspired by the famous picture of Jim Bridwell, Billy Westbay, and John Long (photo on the right, author’s note). In the picture, they stand at El Cap Meadow after they got to be first climbers to ascend El Capitan in less than 24 hours. (In 1975) We repeated that scene in a modern context. 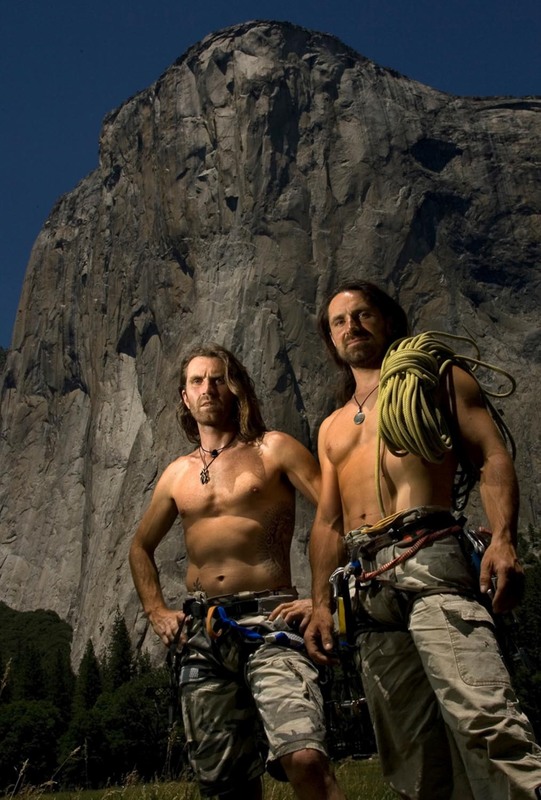 You’ve made a speed record on El Cap with your brother Thomas back in 2007. Did you aim to make it a symbolic end of your climbing career in the valley? We’ve spent a large amount of time in the Yosemite Valley. The reason to pursue that speed record was that we have been through some tough times while free-climbing “Zodiac” (8b, 21 pitches). At first, we didn’t succeed because the spring in Yosemite was quite warm. So instead of that, we focused on speed climbing and we found out that it’s a great thing. But at the same time, it’s a difficult style of climbing. If you want to break a speed record on “The Nose”, the game gets tough. It’s madness. Nevertheless, it motivated us and in the end, we have managed to climb “Zodiac” in a record time (1 h 51 min). Later, in 2007, we broke even the most important speed record in the realm of climbing – “The Nose” (in 2 h 45 min, today, Hans Florine and Alex Honnold hold the record with 2 h 23 min). Thomas and Alexander (belaying) during the record climb 2:45. Your record was beaten again just the following year by Hans Florine and Yuji Hirayama. Have you been thinking about fighting for a new one? We expected others to set new records. I guess we were thinking about breaking it again but if you think about it, it would take another three of four-week trip to succeed… But then, what do you think Hans Florine would do once we break the record? Of course, that would start a never ending fight. Naturally, but it would be different for either of us. I would have to travel half the globe to get to the valley whereas he would just open his door and say: “Oh, the Hubers made a record! Well, that’s a great invitation for some more climbing.” (he laughs) So we broke the record once and were happy about it. Do you remember anything specific from that climb? It was simply wild. A great adventure. Speed climbers really have to go for it. What do you like about climbing with your brother most? We have spent so much great time together… Mountains, that beauty… I cannot pick just one specific thing, it’s a whole complex experience that we have been sharing. Have you had any set roles while climbing? Was either of you for example better at crack climbing? Hard to say. We have always planned the next move at a belay anchor. The one who felt more prepared at the moment would lead the pitch. We always discussed possible solutions for the coming problems. We have always realized the most important aspect of climbing – it is a team effort. Not an individual game. We have to succeed together. If either of us is struggling, the other has to push harder. – If either of us is struggling, the other has to push harder. The solo climbing is a wholly different thing. There is just one climber in the team, and you know it well. 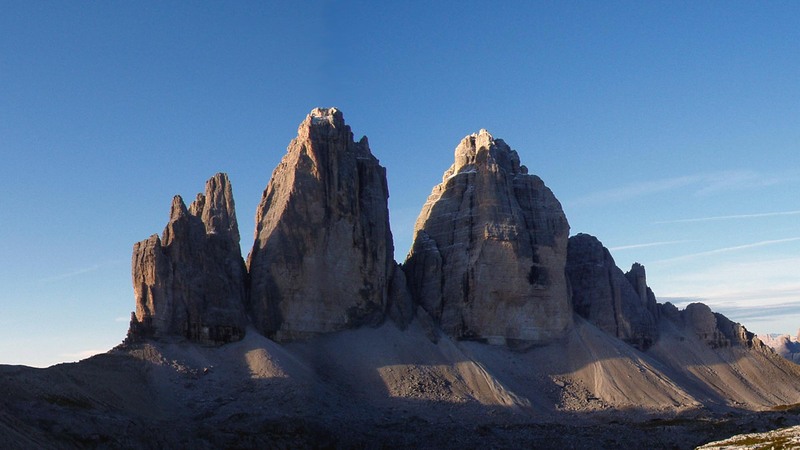 From your solo ascents, I remember “Hasse-Brandler” in the Dolomites. Do you know the first ascenters of this route personally? Yes, I know both of them – Dietrich Hasse and Lothar Brandler. Dietrich is a very old man by now (he was born 1933) but he is still so lively that you can discuss anything with him. I’ve met him during some climber’s association meeting. Have you studied what equipment they used? That was pretty wild. (he laughs) If you want to appreciate how difficult was to make such ascents, you always have to find out about such circumstances. It wasn’t easy at all. I hold these climbers in high esteem. Even today, the route is an 8+ grade when freeclimbed and it is 550 m long. How did you manage it physically? Physically, it was not a problem for me, I see this route more as a “mind game”. Nevertheless, concerning the 8+ grade, in reality, the route is more difficult. You have to consider that when free soloing, you cannot rest at suspended belay anchors. That makes the crucial part 120 m long. You have to climb these meters without a proper rest. 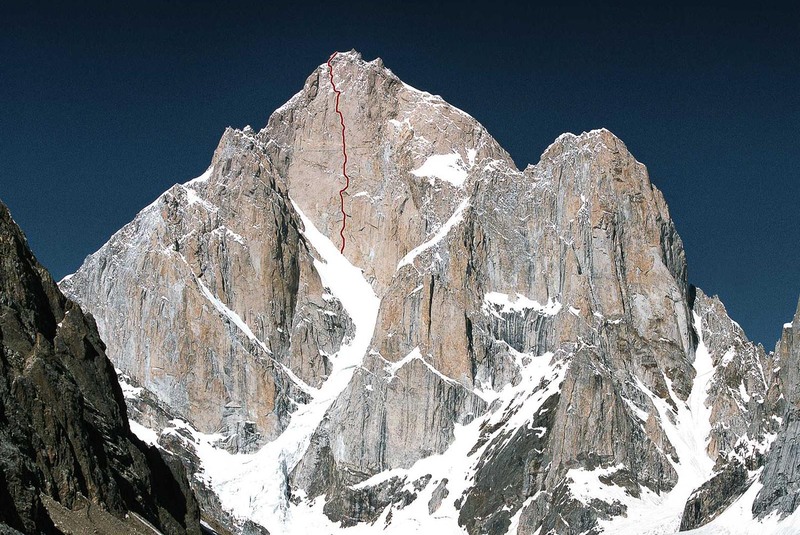 For that reason, the difficulty raises to about 7c (9 UIAA). The hardest pitches contain some no-hand rests (places where you can stand just on your feet and shake out your hands). Yes, that would be possible but your fear cannot let you use them. You need to feel safe. When you’re free-soloing, you never let go! Your head wouldn’t let you do that. So you see suspended belay anchors as a kind of aid in climbing? It definitely makes the ascent easier. 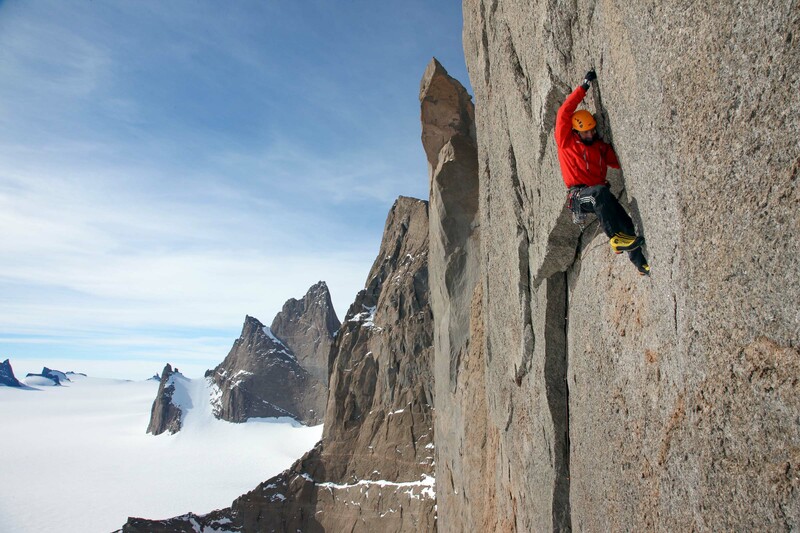 The anchors divide a difficult wall into several shorter pitches. As a result, you don’t need such endurance. 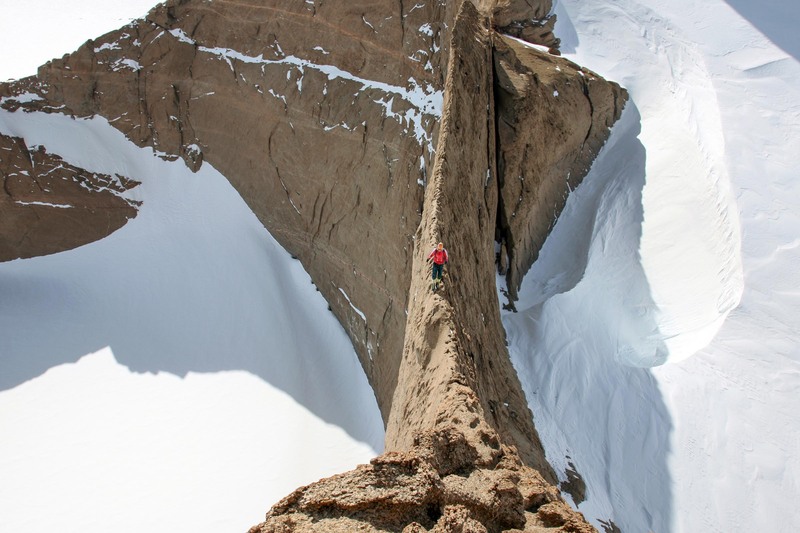 Climbing from a natural belay point such as a ledge to another one is a different situation. According to my point of view, that’s a style of climbing, which could pursued on big walls today. 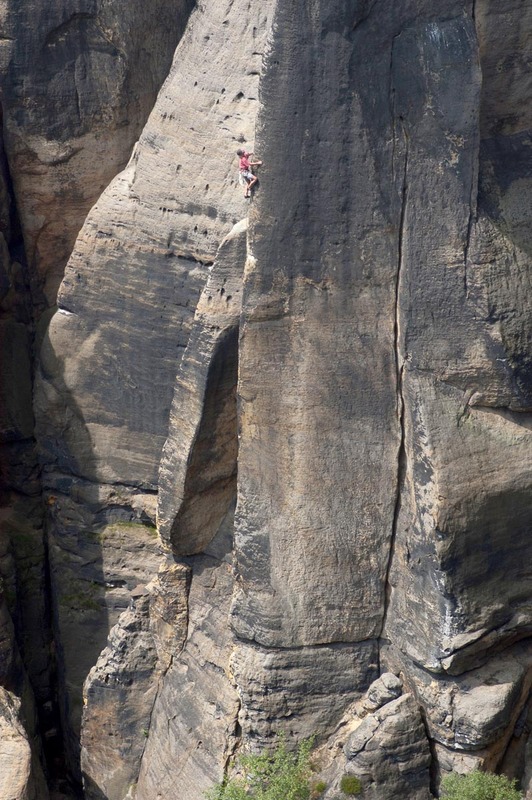 One of these challenges could be climbing the route “Pan Aroma” (8c/8c+, 500 m) from ledge to ledge. In this case, it would, of course, require a long rope. 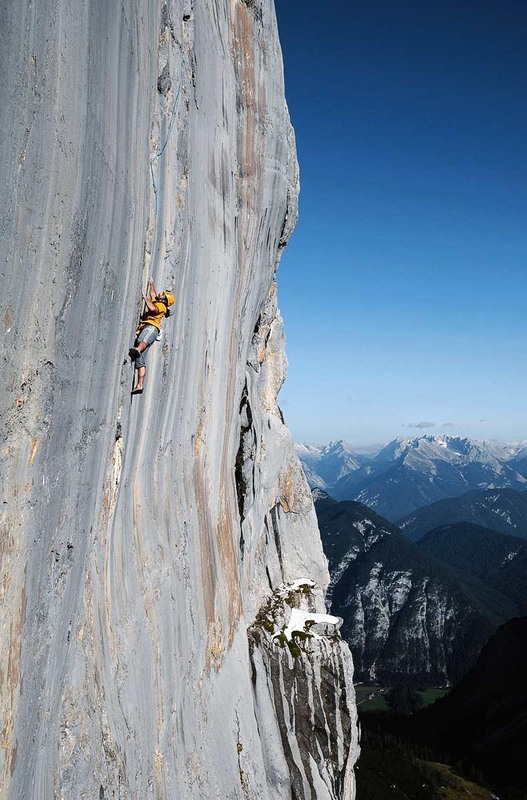 Your free-solo ascent of the route “Hasse-Brandler” was photographed by Heinz Zak. Is he a friend of yours, who often takes pictures of your important projects? We haven’t been working together in the last few years too much. The only reason is that we have both changed our perspectives a bit. Apart from that, I agree with you. He’s not just a photographer but most importantly my friend. A real friend. I would say that it wasn’t only me who climbed that solo – that ascent is known because of the style of photography he first used there. His approach, extensively applied on photographs of El Capitan is still employed nowadays. I would like to stress one important thing about this issue. 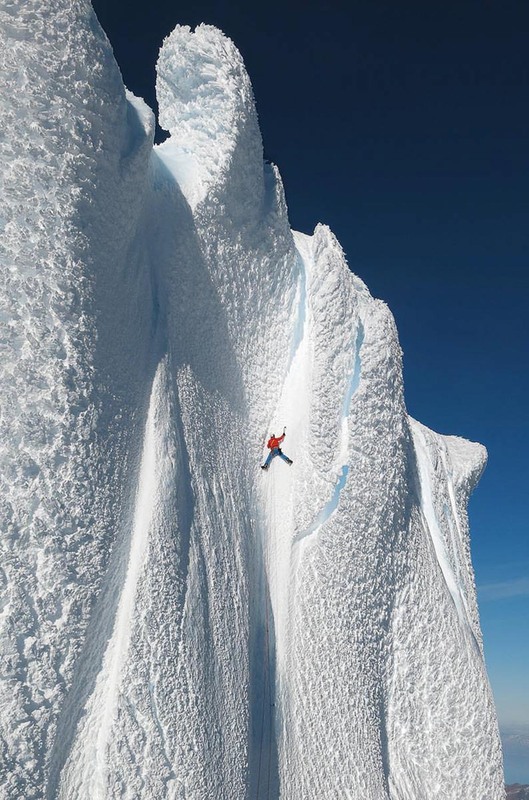 When we are taking pictures or filming on the wall, I always repeat the climb. For example, on the “Hasse-Brandler” route I wasn’t soloing the whole wall while being photographed but just the crucial parts. Such a presence during my first free-solo climb would mean an opportunity to escape. If I had a problem, I could just call: “Hey, Heinz, could you pass me a harness? I will abseil from your fixed rope.” That would mean a different experience and it wouldn’t be a real free solo. 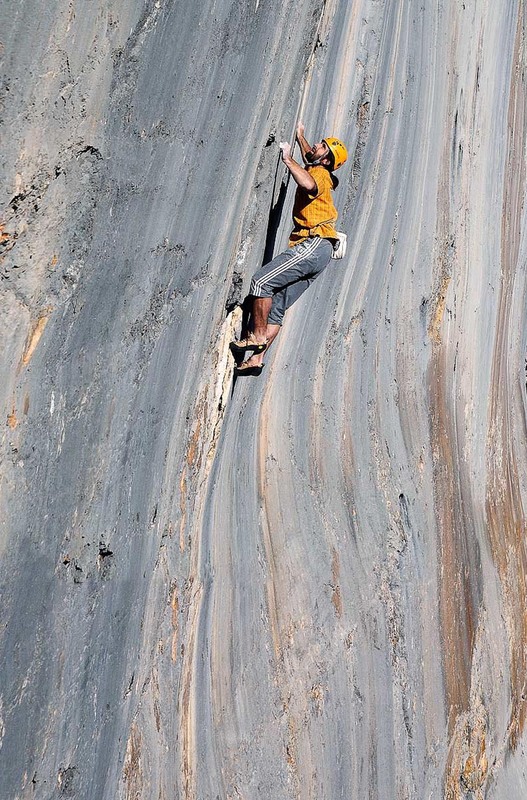 In real free-soloing, they only take pictures of me from a distance using a zoom lens. 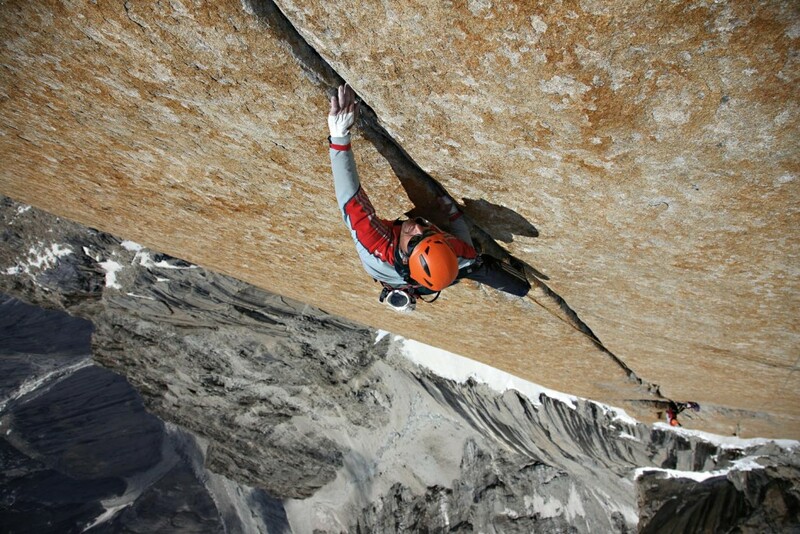 What is the strongest feeling that you remember from the free-solo of “Hasse-Brandler” route? The strongest feelings came even before I started to climb. In that moment, you are in a world which has been turned upside down. You have black thoughts about your death… a breakdown in the middle of the wall when you’re not able to make the next move… a slip of your foot… But then you suddenly feel strong and you feel a wave of self-confidence. “I know I can make it!” you keep repeating inside your mind. In the moment when you start to climb, you have to become absolutely focused and so you let go of these thoughts. You are just making one move after another. You get into the game and then it starts to work well. The negative stress is gone and you become fully focused. When the route gets easier, you feel more and more free. Later, when you stand on top of a mountain such as Cima Grande, it is so powerful experience that you stop thinking about tomorrow and yesterday… You are just up there, enjoying that precious moment of your life. Both past and future are gone. You just live the present moment. 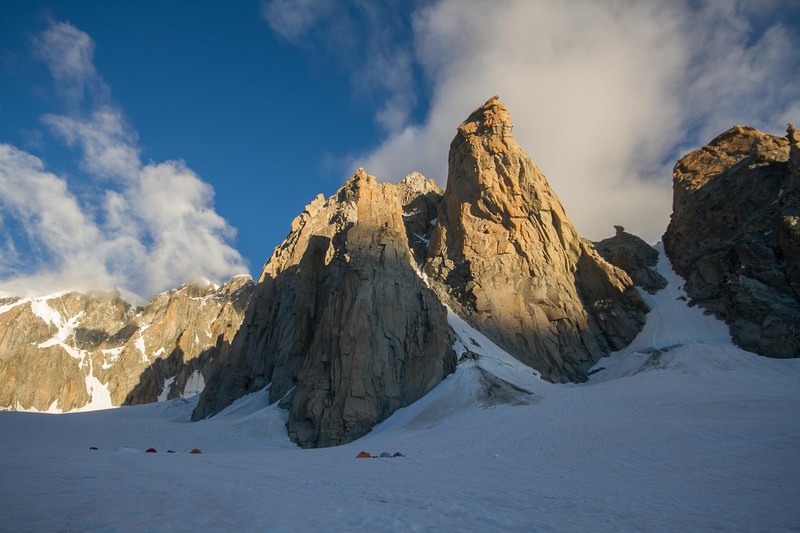 How do you recall the Grand Capucin solo ascent? In some aspect, the climb was much more pleasant than the “Hasse -Brandler” route. It was a beautiful mountain with glacier scenery around. Of course, it was hard but in a very different way. The difficulty was not concentrated on this route; there were no overhangs (“Swiss Route”, 6b, 11 pitches, 450 m). I knew that it was a new challenge for me because I had to climb it both up and down. The greatest moment was when I reached the summit. Some birds flew by, black jackdaws. Of course they wanted to get some food from me but the only thing I had was the chalk bag. I sat down and they were curiously attacking me: “Tink, tink, tink. Tink, tink, tink.” They kept expecting that I will give them something. Their experience told them so. Then they became bored with me because I really didn’t have anything. They flew away, made a circle, and landed back at my feet. They looked at me (Alex imitates how they rolled their eyes), and then they flew away for good – in few minutes they were past the horizon. In that moment, it has become clear to me that tops of mountains are theirs. We are just short-time visitors up there. I was looking at the top of the tower looking at vertical wall all around me and I wasn’t able to spread my wings and follow them. I have realized that I was probably at the most isolated point in the Europe. Yes, I could call for a helicopter by yelling “Help!” But do you realize what would that mean? I couldn’t let that happen. I had to climb all the way down by myself. How was the way down? I think that I downclimbed it under control. The most difficult point was to start my way down. When you begin at the foot of the mountain you are gradually getting used to the exposure, the terrain becomes increasingly vertical, and you have a chance to accommodate your mind. But on your way back you are sitting on the top and suddenly you have to climb down. Yes, the first few meters are relatively inclined but then boom! You see 400 meters of the rock face beneath your feet. That’s a real challenge for your mind and determination. It is hard to continue. You have to convince yourself. Have you ever had to return from a free-solo attempt? Yes. For example a few times from “Kommunist” (sport 8b+ route, which Alex climbed without a rope, the hardest free solo ascent in history according to the grading system), and also from some routes in Wilder Kaiser and Brechtesgaden. Even from some easier routes, which I had no information about. If you don’t know anything about a route you have to have a certain degree of discipline or maybe an ability to return in the moment when you don’t feel comfortable enough. You have to understand that if you cannot continue you have to downclimb everything you have ascended so far. You should set yourself a limit beyond which you would never go. 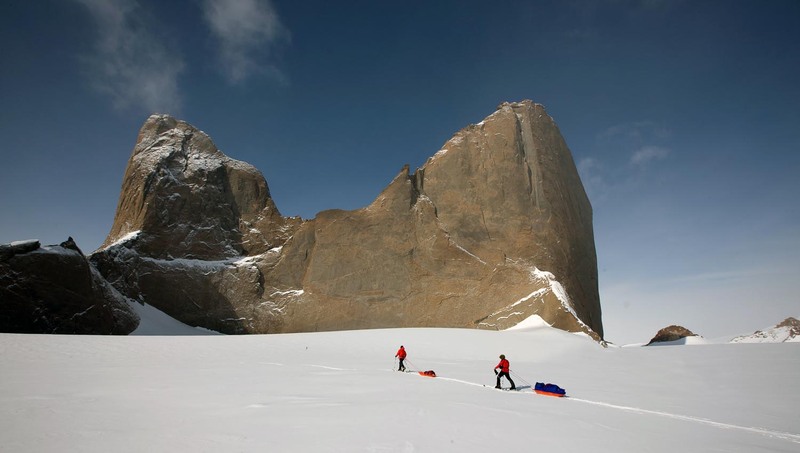 In 2008, your climbing team made some difficult first ascents in Antarctica. In the report, you wrote that the temperatures were around -30 Celsius. Nevertheless, when you were climbing you did not even put on your gloves. How do these north faces (southern hemisphere) warm up by sunlight? On the wall, the temperature was probably only slightly under zero. But that’s not a problem. In such cases, I am mainly concerned if there is any snow on the rock. When you use holds full of snow, you start to feel cold quickly. However, when the rock is vertical enough, it is dry and you can use the perfect friction. 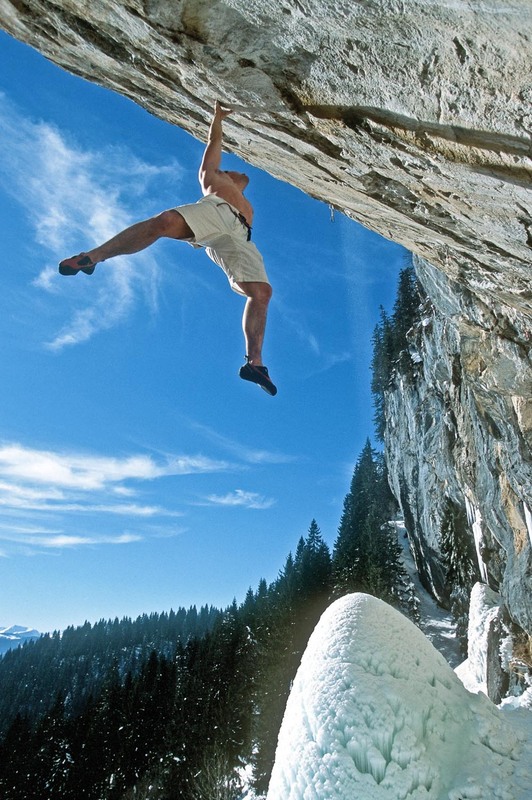 It’s the same with boulderers, they also prefer minus five degrees provided that the rock is dry. Is it more difficult to climb or to belay in such place? (he laughs) That’s not an easy question. I think that the climbing was hard, but belaying was just suffering. (he laughs again) So I have preferred climbing to belaying. Yes. We tried climbing in climbing shoes only a few times but it was so cold that we quickly returned back to boots. Mountaineering boots are surprisingly effective because most of the routes there follow cracks and local granite contains big crystals. So even when you follow a thin crack, you can always use the firm sole to stand on the rock. It sticks, at least on that material. And when you climb hand cracks you can just stick the boot inside and twist it. It’s a lot of fun. 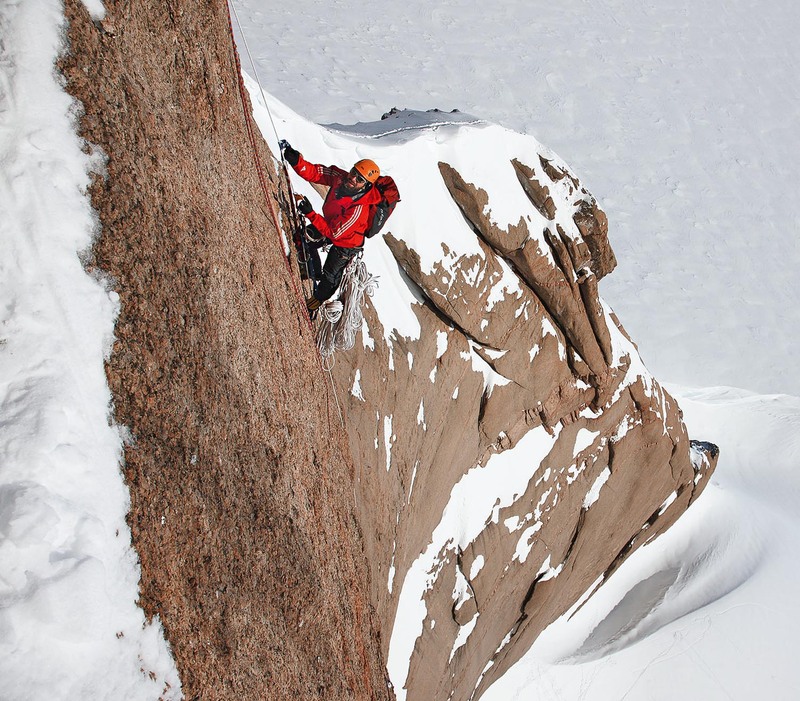 Climbing at Antarctica requires you to follow strict rules. You cannot leave anything there. Yes but that’s quite natural. You have to bring back everything that you bring to the climb. Did you leave anything on the wall? We left belay anchors. It’s an interesting question if that should be allowed or not… From my point of view, we haven’t left anything useless up there. I also suppose that everybody, or almost everybody, who travels there follows the rules and brings everything back. By the way, most of the waste is produced by transport. You can see it for example when you travel with Russians. Their technologies get a bit messy. 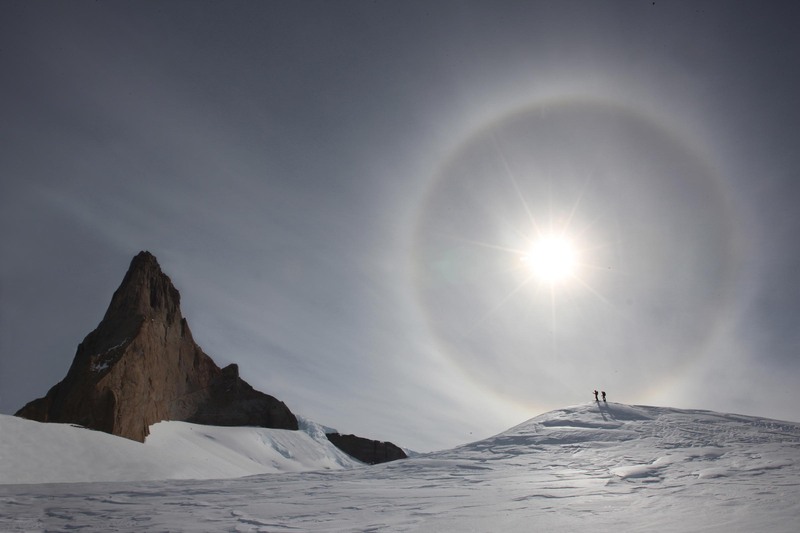 In Antarctica, you have made a route called “Eis Zeit”. There is a famous route with a same name on sandstone in Saxony made by Bernd Arnold. Is it a coincidence or intentional allusion? Do you know him? Eis Zeit – “The Ice Age” is in the case just a coincidence. 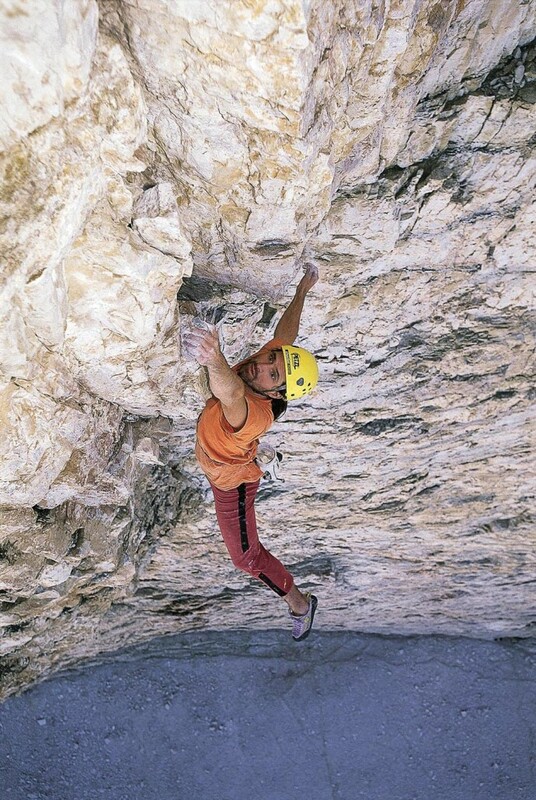 Nevertheless, I know Bernd Arnold, I have climbed with him a few times and it has always been a great experience. He has shown me various routes and rock towers. We have spent great days together. We’ve climbed no extreme routes but the climbing was always amazing. I remember climbing with him on the tower Höllenhund, The Monk, and the classic Gondakante route on Rauschenstein (VIIIa, 6a+ fr.) or amazing and exposed „Buntschillernde Seifenblase“ on Falkenstein (IXb, RP Xa, 7b fr.). It seems that you like to recall climbing on Elbe Sandstone and the local approach. Yes, that’s certainly what I like about this area – strong traditions and a charming, picturesque landscape. Why do you think that such tradition should be kept? You can find sport routes all around the world but this place has its genius loci, which should be kept for the future generations of climbers. It’s the same as with architecture – when you see a unique building you try to maintain it as well because later, people will be proud and happy that they can see it. Moreover, routes on the Elbe sandstone can be climbed safely, you only have to know how to place the knots and slings. The more you keep trying, the more experience and knowledge about a history of that area you get. He was born in Trostberg (Bavaria, Germany) in December, 1968. He has a master degree in physics. 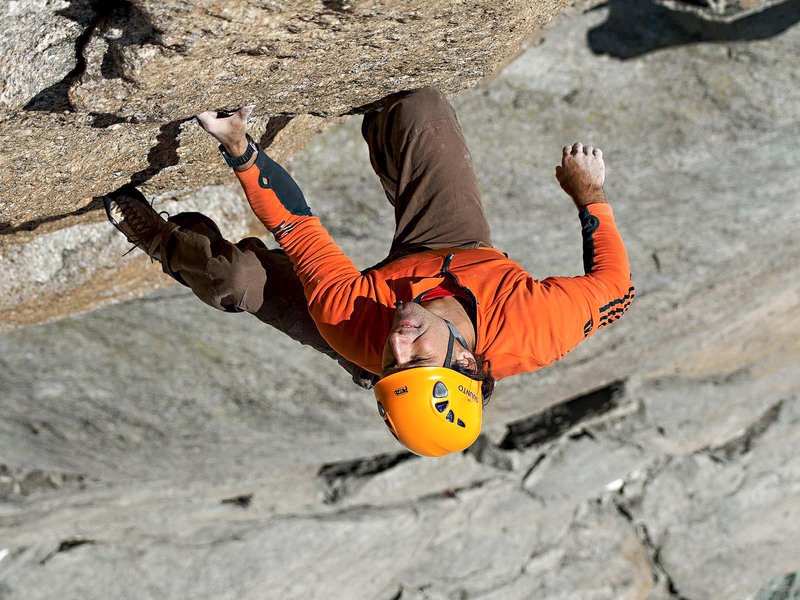 He is one of the best all-round climbers in the world . 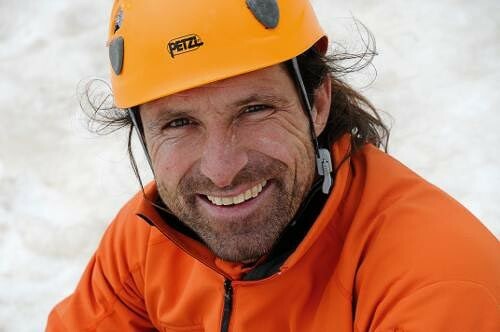 He has climbed sport routes of grade 9a+ and opened number of mentally and physically challenging big wall routes on different continents, he free-soloed legendary European big walls, and he climbed the world’s hardest free-solo ever (8b+), he also climbed an eight thousand meter mountain (which he doesn’t even mention in his CV). He lives in Bavaria with his wife Kristina and three children (Anna, Maria and Luis). You can read more about him and his ascent at the official website of Huber brothers “Huber Buam”.